Let Wendy guide you as she shares with you many helpful tips from her Pineapple Friends; Nancy, Lynda, Eleanor and Jodi. You have the choice to make either the table runner or a set of four place mats. This is a technique class. You will learn to piece and sew the pineapple block without needing any special pineapple tools, rulers, or printed foundations. You will be learning how to use the regular rulers you already have. 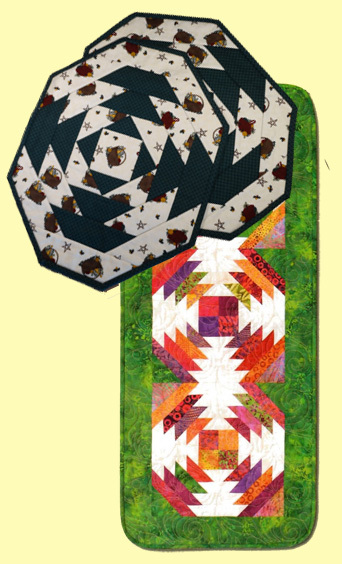 After class you will be able to make pineapple blocks that have fussy cut centers, different sized rounds, be able to size your blocks to your liking, and piece any size of a quilt. Pattern required – $8.00. Skill level – advanced beginner, intermediate. Place mats 13”x 17” each, table runner 17”x 40”.